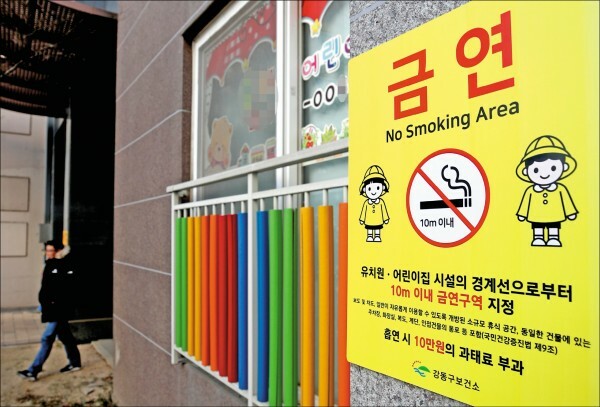 South Korea’s Ministry of Health and Welfare said Sunday smoking near day care centers and kindergartens will be banned starting this week, with violators being fined 100,000 won. As of Monday, smoking within 10 meters of the 390,000 day care centers and 9,000 kindergartens in the country will be prohibited. The Ministry said the decision aims to protect children from secondhand smoking. Provincial governments are also ordered to put up signs notifying smokers of the regulation around day care centers and kindergartens. The ministry said it will give a grace period through March 30, so as to give people time to adjust to the changes.